Can dental implants change the shape of the face? Many patients ask us if dental implants can change the shape of the face. And the answer is that they absolutely can! But, more importantly they can prevent changes to the shape of your face. Many people don’t realize that the loss of a tooth has a much greater impact on the mouth than just an unsightly gap between your teeth. There is also an impact on the jaw as a whole. When you lose a tooth, it triggers a chain reaction in your mouth called resorption. This begins as soon as the tooth is removed from the mouth. Each tooth in your mouth is providing constant stimulation to the jaw bone. This in turn signals the body to provide the bone with the calcium it needs to remain dense and strong. When a tooth is removed, the body reroutes the calcium – mistakenly thinking the jaw no longer needs it. This leads quickly to the deterioration of the jaw bone which can significantly shrink in size. When you see older people with a sunken in appearance it is a result of resorption. That being said, obviously keeping the jaw bone healthy, strong and intact will play a key role in your appearance as you age. Making sure you take action as soon as you lose a tooth is critical to preventing bone deterioration as you can lose up to 25% of your bone density in the first year after losing the tooth. That being said, however, it is never too late and even if some bone density has been lost, replacing a tooth will still have a positive impact on the shape of your face. Especially around the mouth as wrinkles disappear with your new smile. Dental implants are a great way to prevent the process of resorption because once implanted, they immediately let your body know that it’s time to bring back the calcium to the jaw. 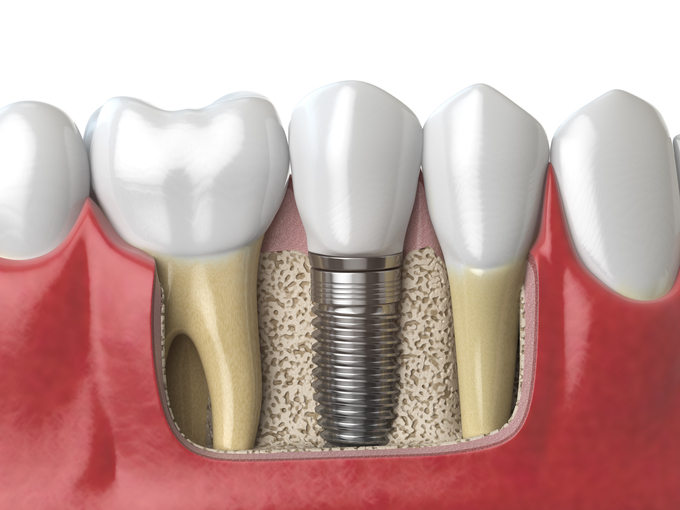 When the dental implants are placed, a titanium post is implanted under the gums securing it to the jawbone. The body reacts to the titanium the same way it would to natural matter so once the implant is secure, the body starts a process called osseointegration where it begins to deposit bone around the new tooth. Dental implants are comfortable and feel like natural teeth! Your jaw treats the implant just like it would your natural tooth. This step takes some time, but it will give your new tooth the same stability you had with your natural tooth. During this time you can wear a denture and after a few months you will have your implant attached and it will be as good as new. If you’ve lost a tooth and wish to discuss getting a dental implant, give us a call today.